The gym is not a place I associate with insight into the important spiritual or intellectual issues of our day. Nor for that matter is Time Magazine. I had just finished my workout on the elliptical machine and was on my way to the weight room when I glanced at the magazine table in the hall and in the corner of my eye caught the cover of Time. The cover article “God vs. Science” got my attention. Yet it was as much the spaciousness of the cover design that held my interest. In contrast to Time’s usual dark and busy cover, it was a large white field mostly empty except for an uncurled DNA double helix sauntering down its length to one side. The DNA bases turned into rosary beads and the "molecule" ended up holding a cross--- but I didn't see that until later. I grabbed the magazine and brought it with me to the weight room. The body of the article turned out to be a debate between an evolutionary biologist and a Christian geneticist. Richard Dawkins , a well-known evolutionary biologist is virulently anti-religion: his recent book is called The God Delusion. The geneticist, Francis Collins, led the effort to decode the genome: his recent book is called The Language of God: A Scientist Presents Evidence for Belief. A while back I heard Dawkins debate a leading intelligent design proponent on NPR. I am very attached to the idea of evolution---to its power and elegance: my sympathies were certainly not with the fundamentalist. However I felt there was something lacking in the case that Dawkins made. Evolution and a sense of a deeper purpose or meaning to existence than that of the material world are not necessarily opposed to each other. I have trouble with the concept of God, but I do believe in the reality of something beyond the material world. Francis Collins, the geneticist argued--- as do many scientists of faith--- that the fact that the six universal or cosmological constants work out to be just what they have to be to support life indicate that the universe was the handiwork of God. Most scientists agree that if even one constant had been a little off in one direction after the Big Bang--- for example if the gravitational constant had been off by one part in 100 million million --- the expansion of the universe would not have occurred in a way that would have eventually supported life. This is called the anthropic principle. Dawkins countered in part that this assumes that the cosmological constants are fluid rather than fixed. "People who believe in God conclude there must have been a divine knob twiddler who twiddled the knobs of these half-dozen constants to get them exactly right. The problem is that this says, because something is vastly improbable, we need a God to explain it. But that God himself would be even more improbable. Physicists have come up with other explanations. One is to say that these six constants are not free to vary. Some unified theory will eventually show that they are as locked in as the circumference and the diameter of a circle. That reduces the odds of them all independently just happening to fit the bill." Certainly it is difficult to imagine the divine knob twiddling. Yet much more interesting to me is the other tact he and others use to argue against the difficult to account for coincidence implied by the universal constants working out just right to support life. If there were not just one, but a very large number of universes with different cosmological constants, then finding one where everything worked out right would not be so wondrous and would not necessitate an underlying intelligence. "The other way is the multiverse way. That says that maybe the universe we are in is one of a very large number of universes. The vast majority will not contain life because they have the wrong gravitational constant or the wrong this constant or that constant. But as the number of universes climbs, the odds mount that a tiny minority of universes will have the right fine-tuning." In response Collins invokes Occam’s razor, saying that he finds the idea of a designer a simpler hypothesis than postulating a large number of alternative universes. "This is an interesting choice. Barring a theoretical resolution, which I think is unlikely, you either have to say there are zillions of parallel universes out there that we can't observe at present or you have to say there was a plan. I actually find the argument of the existence of a God who did the planning more compelling than the bubbling of all these multiverses. So Occam's razor--Occam says you should choose the explanation that is most simple and straightforward--leads me more to believe in God than in the multiverse, which seems quite a stretch of the imagination." This helps illustrate what is so often true. 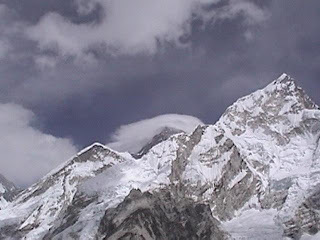 One person’s Occam's razor, or simpler explanation, is another person's Mount Everest--- or nearly impossible impasse. I have to say that I am with Collins on this one (though I would posit an intelligent force rather than a designer-- which is too” knob twiddling” for me). An intelligent force seems to be simpler to me than an almost infinite number of universes. Yet I'm not sure which I would think the simpler hypothesis if I didn't have sporadic experiences that support the existence of a deeper and more sophisticated force working in us and through us. My personal concept of spirituality is pretty much grounded in those brief moments in which I get hints of this larger consciousness in the cosmos. "I accept that there may be things far grander and more incomprehensible than we can possibly imagine…My mind is open to the most wonderful range of future possibilities, which I cannot even dream about, nor can you, nor can anybody else. What I am skeptical about is the idea that whatever wonderful revelation does come in the science of the future, it will turn out to be one of the particular historical religions that people happen to have dreamed up…. If there is a God, it's going to be a whole lot bigger and a whole lot more incomprehensible than anything that any theologian of any religion has ever proposed." The term, "infused knowledge", sometimes used in Christian theology, is a term I find more descriptive and forthrightly theistic.